How do you monitor temperatures in your data centers currently? Is it useful and cost-effective? Probably no due to high measuring costs and efforts or inaccurate data. We have a much better solution for you. Read our newly published Data Center Case Study and you will find the answer! For most companies, turning the air-conditioners to the lowest possible temperature every day and manual monitoring seems to be a feasible way to combat the temperature monitoring challenges brought by increasing processor speed and server rack density. However, such solution risks facility reliability and increases overall costs. The Tempcorder™ tags - Sense Tag and Moist Tag, possess accurate digital sensors, ensuring temperature and humidity data are measured reliably and automatically. 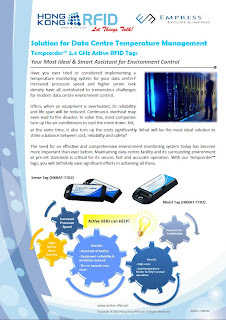 Upon simple installation process of RFID readers and PC with the tags, any changes could be detected and notified for timely adjustments or preventive actions. With this automatic temperature monitoring system, human errors in measurement as well as wasted energy in cooling system could be greatly saved to lower costs. Better environment management could be achieved at the most cost-effective way now.